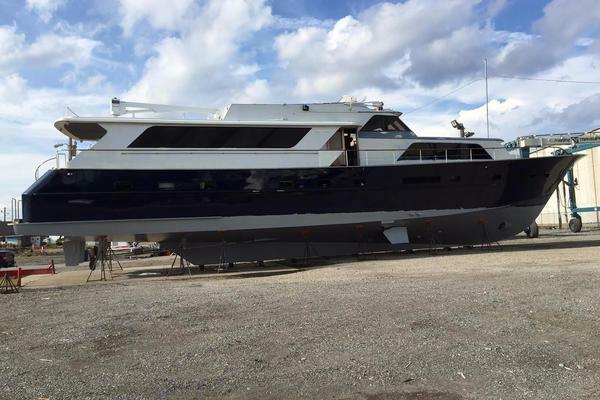 United Yacht Sales New Jersey would love to guide you through a personal showing of this 79' Dyna Motor Yacht 2007. 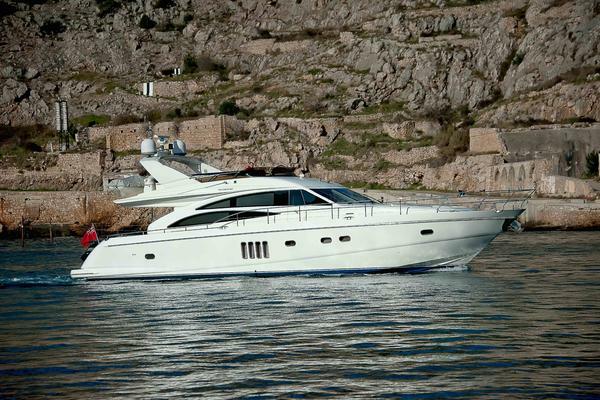 This yacht for sale is located in En Route to Miami, Florida and priced at $1,290,000. For a showing please contact us by filling out the form on this page and we will get back to you shortly! Entering the salon through the aft full-width glass sliding doors, you are surrounded by the custom luxurious interior by Brazilian designer, Oscar Mikail. The entertainment center is concealed in latticed teak cabinets with drawers to port, incorporating a Plasma TV on an electrical lift with access to the central media system, Burmese teak flooring, cream suede ceiling panels, and a contemporary couch to starboard. Ocean view from the 6 large oval portholes grace this cabin from port and starboard, the centerline custom king bed with side drawers dominates the room and there is an abundance of storage with large cabinets below the portholes plus additional drawers under the bed, making this cabin ideal for extended trips. A 32" Sony flat screen TV, with surround sound Bose System, and movies/music on demand keeps guests entertained. To port is a walk-­in closet with hanging space and storage drawers.Master Head:To starboard is the master en-suite bathroom which includes a large mirror, walk-­in shower, custom Gessi Fixtures, and toilet with integrated bidet. Custom white marble countertops and flooring finish this large bathroom off with a luxurious feel. Each cabin has two oversized single beds, both with large hanging lockers and additional storage above the two portlights and below each bed. These cabins are flooded with natural light from the large sky lights in the ceiling panels. A 19" LCD TV and Bose audio/video equipment are incorporated into the room, so guests can relax in private.Guest Head:The en-suite bathrooms have a walk-­in shower, mirrored sink, and toilet with integrated bidet. These bathrooms are finished in white lacquer with custom marble countertops and floors. Accessible from the rear of the salon are the aft staterooms.Queen Cabin:The first is the VIP cabin featuring a Queen ­sized bed, walk-­in closet with walk-­in locker hanging space, and two separate cabinets with drawers and shelves, as well as overhead lockers. A 19" LCD TV and Bose audio/video equipment are also incorporated into the room. This stateroom also features electric blinds.The en-suite bathroom has a large walk-­in shower, toilet with integrated bidet, floating stainless steel sink and marble countertops and floor. Twin Guest Cabin (Kids Cabin and Laundry Room): This cabin has elevated twin beds, a hanging locker and an en-suite bathroom with walk-­in shower and marble counter tops. All cabins are finished to the same high standards, with beautiful high gloss teak cabinetry and cream-colored soft goods. (This stateroom can be used as a good 2nd crew stateroom). Bow:The bow area onboard "Vive" is a much larger area than other manufacturers of a similar size, and has been well utilized for guest use. Two large sun pads cover the port and starboard sides, allowing owners and guests an additional outside place to relax and enjoy the ocean. Four Bose weatherproof speakers powered by individual power amplifiers.Aft Deck:Boarding to the aft deck is via the hydraulic passerelle. The vast aft deck features a varnished teak dining table and built­-in U­-Shaped settee for 8 with deck space for more. There are two cabinets on the forward bulkhead with a drink refrigerator and storage. On both sides are wide walkaround decks to the flybridge which also lead forward to the bow. Moving up to the port and starboard stairwells from the aft deck is a large flybridge ideal for fun in the sun and entertaining large groups. A semicircular shaped settee and high/low table combination aft. This area can be set up for casual dining with virtually uninterrupted views of the horizon, or set up for relaxing sun bathing. Forward to port is a large Jacuzzi for 4 people, or can be converted into a raised sun pad for sun bathing while not in use. Forward is a double helm companion a sink and barbecue grill. A removable Bimini Top covers the helm and Jacuzzi. Aft is the tender and davit, and two 8­ person life rafts. All cushions are made of Sunbrella all have mildew rest. 6" foam non-absorbent. Domestic AC power 110/220V 60Hz, provided through a shore power converter by ASEA. Will accept any. The engines are efficient Common Rail Diesels. The complement of equipment, including navigation, two generators, bow and stern thrusters, water maker and power converter, is very extensive, complete and updated.Roomy, versatile, elegant, upgraded, well maintained by a full-time crew. Where else can you find: Walk­around and full beam, 4 stateroom, 2 crew cabins, worldwide power with lots of extras like inverter for silent nighttime operation?